Note: Rockin has a TON of amazing photos from today on her blog. 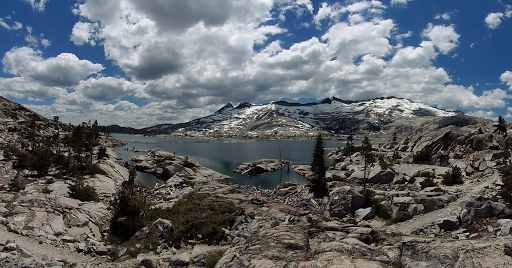 Today was one of those days that will go down as one of my most memorable days of hiking on so many levels. It was filled with so much wonderfulness and layers that I’ve decided to post it in two parts. 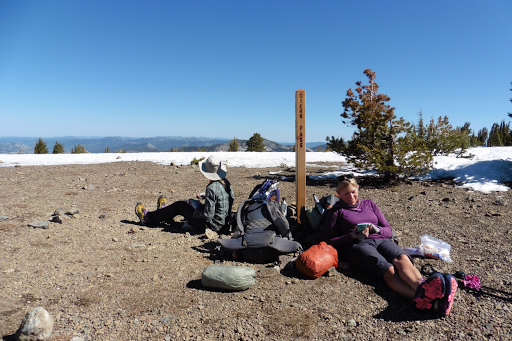 It was our best night of sleep yet on the TRT with perfect overnight conditions. We all awoke feeling well rested and refreshed. The big event of the morning was that we were going over Dicks Pass (9400′). We knew there would be snow towards the top, but weren’t sure how time consuming and taxing it would be. 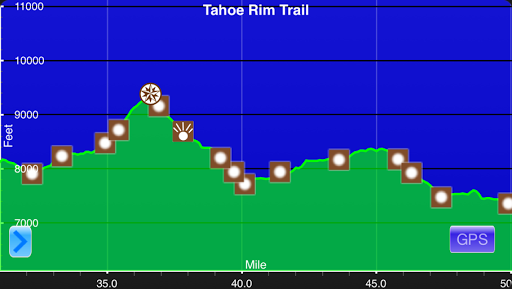 We got started at 6:30am knowing we were 19mi away from Echo Lakes Chalet. We wanted to get there well before they closed at 6pm so we could hopefully have dinner there. I also had a friend hoping to meet us there for a bit before we hiked on a couple miles to camp. We started off with a wooded uphill hike that took us to the string of lakes I remembered in this area. Before we went up to Dicks Pass, we went by Middle Velma, Fontanillis, and Dicks Lake. 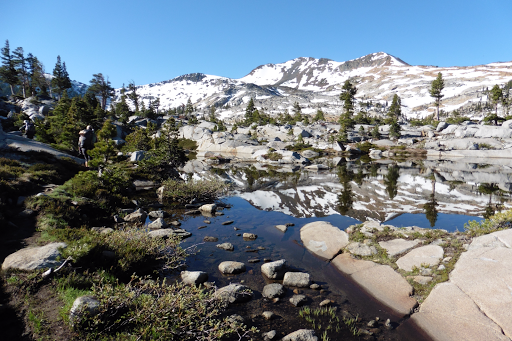 The waters were calm and the snow speckled mountains reflected off the water. 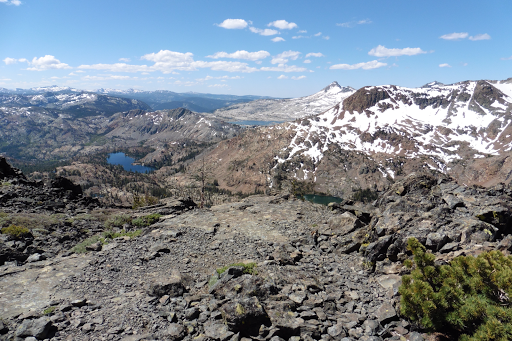 THIS is why Desolation Wilderness is so desired and permits are limited. We ran into 12 thru hikers today and some section hikers coming northbound. There were also many people out for a couple nights in this amazing area. We talked with each of them, some at length and it was really fun. There were three hikers that had overlapped with Why Not on previous thru hikes and that was really fun to see those random chance meetings that occur along the trail. 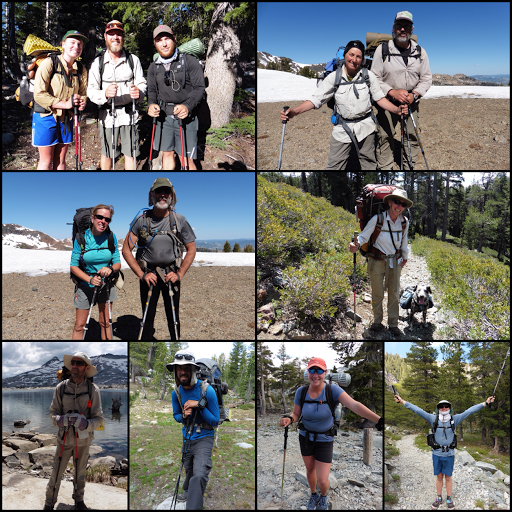 Here is a collage of all the hikers we met,l eft to right, Top: Ice Cream, Red Bass,Thunder Thighs, Leap Year, Alien March; Middle: Day Tripper, One Step, Barb and her dog Angel; Bottom: Milk Jug, Emil, Merkel, and Bean. After passing the morning lakes, we had the switchbacks and then traverse to the top of Dicks Pass. We figured it would be time consuming with snow, but it wasn’t and there was only about 30mins in and out of snow towards the top. We heard a pair of thru hikers off trail in the snow calling to each other, but didn’t meet them. At the top, we knew we’d get service for the first time in 24hrs. We all sat at the top for over an hour eating an early lunch and getting blog things done. Here’s Why Not and Rockin’ in action with the smartphones. While we sat up there, many hikers came by. 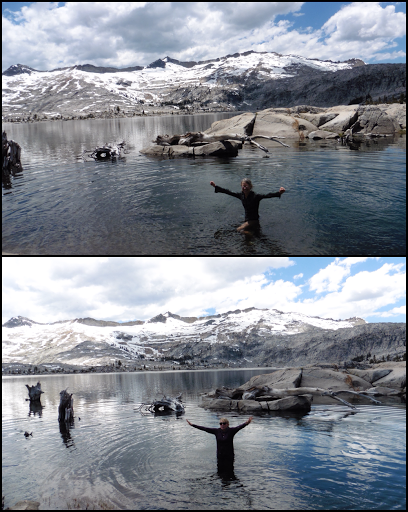 Most entertaining of them all was Alien March who is a woman with the most boisterous spirit that has hiked the PCT twice and huge chunks the last 8 consecutive years. 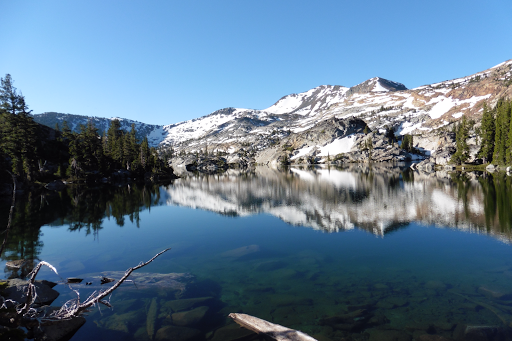 After our extended break, we headed down to all the lakes on the south side of Dicks Pass. Oh man! Just ridiculously wonderful! The sun got much hotter than it’s been all trip and I used my umbrella much of the afternoon for protection. Rockin’ took to walking through and sitting in the water to cool off, ha! I have to show the map of this area to show how the trial weaves between the lakes. In 2011, on day 80 of my thru hike it was sooo confusing with it under snow I can’t even tell you where I went. There are many other trails leading in various directions that are now signed with new posts and we still took a wrong turn today and got confused a couple of times! 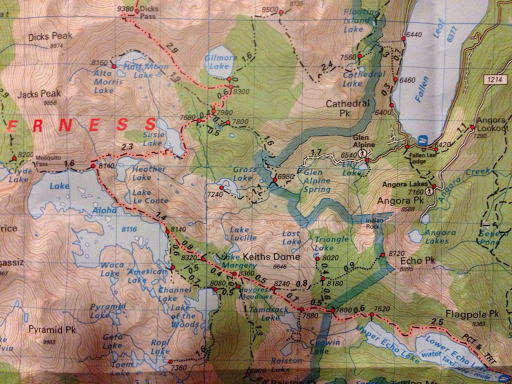 We passed Lake Gilmore, Susie Lake, Heather Lake, Lake Le Conte, and Lake Aloha. Just amazing! Rockin’ and Why Not couldn’t resist a dip in Lake Aloha.